It begins with the introduction of the dysfunctional Mehra family which consists of Kamal Mehra (Anil Kapoor) a self made successful businessman who is on the verge of bankruptcy. His wife is Neelam Mehra (Shefali Shah) who is often sarcastic in relating to him, yet she showers all her motherly love (and pampers) her grown up laadla Kabir Mehra (Ranveer Singh). Despite the Mehra couple having a million differences with each other, they pretend to the world that they are an ideal couple, showing off in the society as they are often concerned about what the people around speak of them. Their daughter Ayesha Mehra (Priyanka Chopra), inherits the acute business acumen of her father. Being a very successful entrepreneur, she has been featured by the ‘Forbes’ magazine. Ayesha is unhappy with her marriage to Manav (Rahul Bose), a consequence of her parents calculative moves. And finally, the most important member of their family Pluto Mehra (a dog) who narrates their family life and events through out the film with a voiceover by Aamir Khan. Kamal Mehra is keen to pass on the baton of their business empire to his 25 year old son Kabir Mehra whose interest lies in flying (he owns a private plane). Kabir is inept in business strategies and makes blunder often, much to dismay of his father. It is their 30th marriage anniversary and the Mehras plan to arrange a celebration aboard a luxury cruise with select family, friends and business associates. The senior Mehras find it suitable to invite “Mr Moneybags” Lalit Sood (Parmeet Sethi) widely referred in business circles as a shark, with the intention of enticing him to invest in their loss making empire. The bait would be their handsome dude Kabir Mehra to get married to Noori Sood (Ridhima Sud) who’s experience a broken engagement. While on board, Kabir falls in love with a London based performing artiste on the cruise – Farah Ali (Anushka Sharma), Lalit Sood’s daughter falls in love with Rana Khanna (Vikrant Massey) and the already married Ayesha Mehra announces to get a divorce. 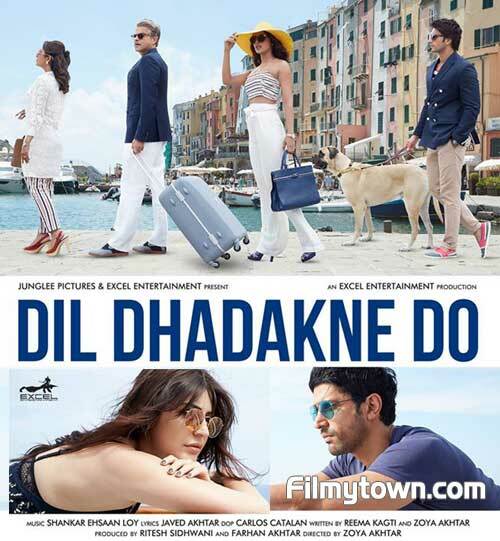 There are some song and dance sequences on board, while the title song Dil Dhadakne Do catches your fancy, the rest are just average. Except for some breath taking and amazing visuals of France, Italy, Spain and Turkey and incredible performance by Anil Kapoor, there is very less in the film to impress the audience. An average viewer gets his quota of whats happening in the high society circuit in almost every third soap on Television. Zoya Akhtar’s earlier film Zindagi Na Milegi Dobara still remains miles ahead of this preachy high-society drama.